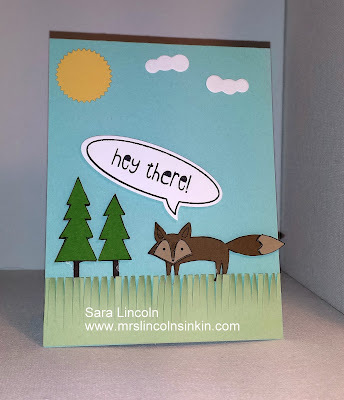 Mrs. Lincoln's Inkin: Hey There!!!! Hello stampers!!! Welcome to Mrs. Lincoln's Inkin'!!! Today's share is a card that uses all Sneak Peek's. Well all but the colors of the things are Sneak Peeks. Oh my goodness i am going crazy using all the new products from the Occasions Mini that is going to be available January 3rd. OH MY I CAN'T WAIT!!!! My card base measures average size of 4 1/4" x 5 1/2" an i used the Pool Party card stock for my sky. My grass i used the Pistachio Pudding card stock and the new Fringe Scissors!! I have been waiting for SU! to come out with a pair of these for so long!!! I'm so excited they are finally here! The cute little fox comes from the new stamp set Life in the Forest. I cut him out with my Paper Snips, as I did with the trees (from the same set) and then popped them up on Dimensionals to give it a 3D look! Then, the sentiment is from the new set Just Sayin' and then i cut it out with my Big Shot and the coordinating framelits Word Bubble. Well all, there is no showcased product today, since they are all Sneak Peek's and i can't show the whole set of anything yet... so you will just have to wait a few more days, lol:) I know... it's hard but the wait is almost over.